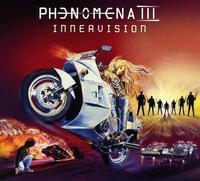 This is the third album from Phenomena, and it was released in 1993. All three have just been reissued. It's interesting that I've landed each of them under a different category heading in this issue, with this one going under non-prog. There are both metal and prog elements here, but overall this fits under neither of those. The biggest reference point, really, is Foreigner. So much of this sounds like that band, and specifically their fourth album. A lot of that reference point comes from the fact that the lead singer, Keith Murrell, sounds a lot like Lou Gramm. Either way, how you feel about that album will probably be a big influence on how you feel about this one. While this features more of a band lineup with less guests than the first album in particular did, Brian May does show up on two songs, "What About Love" and "A Whole Lot of Love." This opens up with a keyboard based section. The vocals come in over the top of that. That motif serves the first verse well. It powers out from there to a section that rocks out like something from Foreigner's fourth album. The guitar soloing is meaty and so cool. Hard rocking sounds with a bit of a proggy edge are on the menu. There are some smoking hot guitar fills built into this thing. Mellower keyboard based sounds are on order here. The vocals come in over the top of this bringing an AOR prog styled sound. The comparisons to Foreigner are again quite valid, but this is meatier than that. The arrangement, particularly when the backing vocals join, is very much set in an 80s style. A cool keyboard based introduction opens this. They fire out to a metallic rocking jam from there. It's high energy and catchy. It really rocks. It has a powerful triumphant vibe to it. This comes in rocking, but drops back to mellower stuff for the verse. It's a balladic cut that has a real AOR vibe to it. The backing vocals again reinforce the 80s angle to this number. This AOR hard rocker is another that makes me think of Foreigner to a large degree. It's a real powerhouse with some cool hooks. A hard rocking metallic edge drives this with a lot of style. It's a real powerhouse stomper. The Foreigner AOR stylings are all over this. The backing vocals return on this rocker, but this time around they don't really make it seem dated. They just add to the power and style of the number. A metallic stomper, this really feels like something that would have been quite at home on Foreigner's fourth album. A melodic number, this is sort an AOR power ballad. It's a strong tune that works quite well.